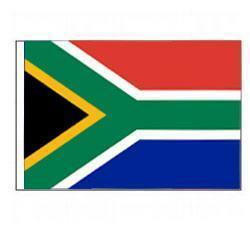 South Africa adopted this flag in 1994. It was designed by State Herald Frederick Brownell. This flag combines principle elements of South Africa’s flag history. The Y shape can be seen as diverse elements in the country’s history uniting. The colors come from the Pan-African flag, the Dutch and UK flags, and the former South African flag.